Yo, Dig Dug, man. Dig Dug, Dig Dug yo. My favorite cave exploration game is Spelunker, but there are a lot of other games that take place underground and in caves. Most of The Goonies is underground, for example, and with other games like Cave Story and Mr. Driller , you've basically got a whole genre going! This time, we're going to take a look at another game from that genre: Dig Dug . For various reasons, I had to take a little bit different approach than usual, but read on to find out more! 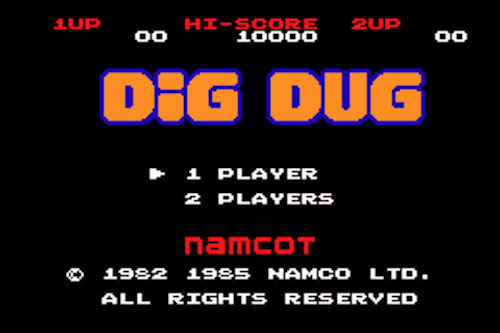 Dig Dug was first released by Namco in 1982 as an arcade game. The arcade version was released in Japan and the US at about the same time, but in the US the publisher was Atari rather than Namco. In the years since then, quite a large number of sequels, ports, and remakes have been released. The most recent Dig Dug game is Dig Dug REMIX, released for smartphones in 2009. To summarize the game flow, you basically dig through the earth and defeat enemies to clear each stage. To kill enemies, you can either inflate them with your pump until they explode, or cause a rock to fall on them. Probably the most interesting thing about the original Dig Dug is that it does have a sort or background music, but it only plays while your character is in motion. The boys over at Mega64 used that as the basis for a skit years ago, check it out! Some of you might already be aware, but Dig Dug doesn't really have a story in-game. There's also not really all that much text in the game in general, and the text that is there is already all in English, even in the Japanese version. With that being said, I had to take a little bit of a different approach this time - but I still found some interesting differences! As I mentioned, after the arcade version of Dig Dug came out, there were a ton of ports. Well, one thing to keep in mind is that back in those days, there weren't too many game consoles or hardware being sold in both Japan and the US. Of the ones that did exist, the Famicom/NES was certainly the most popular, and Dig Dug did get a release on the Famicom, but for some reason it never came to the NES at all. Instead, the game got ported to various PC-based systems in Japan, and in the US it was released for consoles like the Commodore 64. Most of these versions of the game played pretty much exactly the same, but the look of the game itself varies wildly based on the hardware. First, let's take a look at some of the versions of the game released in Japan. And now, some of the different US Dig Dug versions. When all these ports were first coming out, the Japanese Famicom version was one of the closest ports to the arcade version, so it's an even bigger bummer that an NES localization never got made. As far as I can tell, the enemy names have been consistently translated as Pooka (プーカァ, puukaa) and Fygar (ファイガー, faigaa). Props to Namco for the impressive levels of consistency with that. 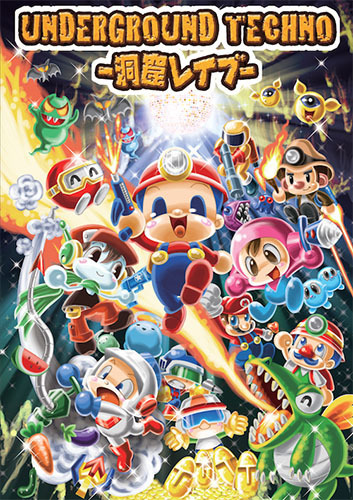 In the first few games, the protagonist is simply called Dig Dug in both Japanese and English. However, that's not actually his real name - in Japanese, Dig Dug's real name is 「ホリ・タイゾウ」 (hori taizou). Not only that, but the Mr. Driller series protagonist's real name is 「ホリ・ススム」 (hori susumu) - they're father and son! 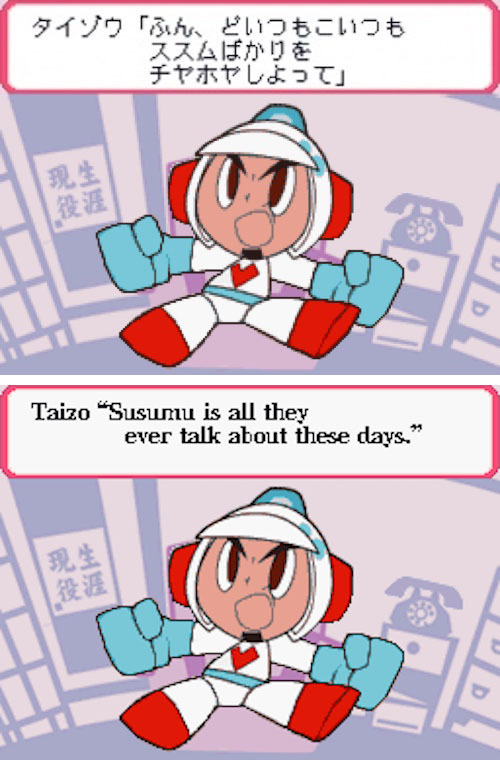 The handful of US-localized games that mention these names leave them in the original Japanese: Taizou Hori and Taizou Susumu. But the names are actually puns! 「掘りたいぞ」 (horitai zo) means "I wanna dig", and 「掘り進む」 means "keep on digging". So not only is none of that carried across into English, switching the name order (an understandable necessity) makes the jokes incomprehensible even if you do know Japanese! 名前が「同じ」だとしても「同じ意味を持っている」ということではないですね。 / Just because the names are the same doesn't mean the names are the same, if you know what I mean. I never came across this before, but Dig Dug actually had a US-only sequel! In 2001, Infogrames released Dig Dug Deeper for the PC. The gameplay is pretty much the same, and it's essentially a 3D reimagining of the original Dig Dug. ちょっとしょぼい感じがしますけどね。 / It doesn't look the greatest, though. There's also a Dig Dug game that was only released in Japan: 「ディグダグアイランド 南の島のプクプクポン」 (Dig Dug Island), released on PC in 2008. It was an original online multiplayer game somewhat based on Dig Dug II . Unfortunately, it didn't even last a year before the service was ended, and now the game is no more. こちらのはなんだか楽しそうでやってみたいです。 / This, on the other hand, looks like something I would've liked to have been able to play. This isn't specifically Dig Dug-related, but I've always wondered about it so I looked into it. The name most of us are used to seeing for the company's products is "NAMCO" (short for Nakamura Manufacturing Company), yeah? Some games from the 80s and early 90s, though, say "NAMCOT". Dig Dug's Famicom version is one of them. I did some poking around, and apparently Namcot was a sub-brand used for Namco's home games division (as opposed to arcade games) in the 80s and 90s. The name supposedly comes from a combination of "Namco" and "mascot" - the home versions of games being miniature "mascot" versions of their arcade counterparts. They stopped using the Namcot brand in 1995, and from that point on everything's just been Namco. They both use the same game logo, and the content of the illustrations is pretty similar, but the styles are totally distinct. The Famicom box art kind of emulates the same style as the logo, while the Atari art goes for a more straightforward-looking style. I couldn't help but chuckle at how distressed the Fygar looks on the Atari box, haha. Interestingly, while the original Dig Dug didn't get an NES release, the sequel Dig Dug II did. Once again the game logos are the same (aside from coloration), as are the illustrations of the main character, but other than that they're completely different. The NES art only has a Fygar on it, while the Famicom art only has a Pooka. Maybe they felt like a menacing dragon would be more eye-catching to US consumers? I do really like how the islands on the Famicom box art replicate the "Dig Dug" logo, it's a shame they did away with that for the NES version. Since I couldn't do a manual comparison this time, I started thinking about other things to compare, and then it hit me: commercials. Dig Dug had commercials in both the US and Japan, so let's take a look. I was really surprised at the crazy level of effort put in to the US commercial. There's even an original song - which at one point was going to be sung by Chuck Berry! The Japanese commercial, on the other hand, is just kind of bizarre, but maybe that in itself got people interested in checking out the game? The new Allkore CD comes out at the end of this month! There's tons of underground game remixes: Dig Dug, Spelunker, Goonies, and more! It's not Dig Dug, but the new Spelunker game for the Nintendo Switch just came out! I'm going to be playing the heck out of it (I probably am as you're reading this). It has online multiplayer, too, so let's all go Spelunking! Also, next month is going to be a non-game article again, so look forward to that!